Canada has apologised for forcing more than 100,000 aboriginal children to attend state-funded Christian boarding schools aimed at assimilating them. Mike Cachagee was one of those children. Mike Cachagee is not impressed by apologies. Aged four, he was sent from his home to a series of state-run church boarding schools, where he was stripped of his language, religion and culture. He was physically and sexually abused. When he returned home 12 years later, his mother did not recognise him. "To apologise for taking me away from my family, for losing my culture and the loss of my childhood and the loss of my mother's love... How does one apologise for that?" he asks. Still, he will be there in Ottawa when Canadian Prime Minister Stephen Harper takes to the floor of parliament for the historic step of apologising on behalf of the nation for one of the darkest chapters in its history. Between the late 19th Century and the late 1970s, about 150,000 aboriginal children in Canada were taken from their homes and forcibly sent to boarding schools, known as residential schools. Originally an extension of the missionary work of various churches, the schools began receiving state funding in 1874 after the government moved away from a policy of fostering aboriginal autonomy and sought instead to assimilate aboriginals into mainstream society. From 1920, attendance was compulsory for seven- to 15-year-olds, although many former students say they were taken at a much younger age. While some parents wanted their children to get an education and felt it was necessary to integrate into Canadian society, many children were taken from their families and communities by force. The goal was to Christianise the children and to erase all traces of their aboriginal culture. One government official in the late 1920s boasted that within two generations, the system would end the "Indian problem". It should "kill the Indian in the child", it was said. 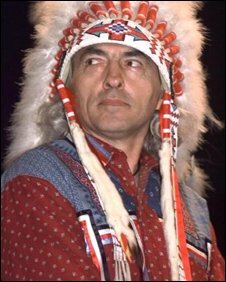 What it did, says Chief Phil Fontaine, head of the Assembly of First Nations which represents Indians and himself a former student, was cause "profound harm, loss and grief to individuals, families, communities and subsequent generations". The system was "assimilation founded on racist premises - premises of inferiority, disrespect, discrimination and inequality", he says. Conditions in many schools were dire, with poor sanitation, overcrowding and a lack of medical care. John Milloy, a professor of Canadian studies at Trent University in Ontario who has written a book on the school system, says it was a deliberate practice to keep sick and healthy children together, leading to high death rates from tuberculosis. Along with the pain of separation from their families, many children experienced physical and sexual abuse, although it was only in the late 1970s and early 1980s that accounts of it surfaced. It is not clear how many were abused, but reports from former students suggest it was widespread. Mr Cachagee, now 68, says he was fondled by one of the staff at his school in Chapleau, Ontario, and then beaten with a strap when he asked her to stop. "I was five or six. I would be in a foetal position on the floor and she would just whack," he says. Now president of the National Residential Schools Survivors' Society, which represents former students, he says the biggest problem for survivors is being unable to express their emotions. "All the emotions that normal people have, we didn't learn them," he says. "We were told our language was that of the devil and that we were dirty Indians. "They educated us, but they educated other people too and they didn't get carted off to residential schools." An alcoholic and a drug user for 20 years, Mr Cachagee says it was only in his 40s that he managed to turn his life around, going back to university, re-establishing relationships with his children and finally realising the value of his Cree culture and language. The government's apology is part of a C$2bn ($1.9bn; £990m) package of measures agreed with aboriginal communities in 2005, known as the Indian Residential Schools Settlement Agreement. Under the deal, about 86,000 former students became eligible for a payment of C$10,000 plus C$3,000 for every year spent in a school. The agreement also provided for funding for the Aboriginal Health Foundation, and a truth and reconciliation programme. Many aboriginal leaders feel the apology has been forced, since negotiations for the settlement agreement started after a number of former students brought cases against the government and churches involved, leading to large payouts. They also point out that the Anglican, Presbyterian and United churches of Canada apologised for their part in the system in the late 1980s and early 1990s. The Catholic church, which ran most of the schools, has never formally apologised but Canadian bishops were involved in negotiations for the Settlement Agreement. Mr Fontaine says he has not been consulted on the wording of the apology, and Mr Cachagee says he has not been approached either. Justice Harry LaForme, the Ontario judge heading the truth and reconciliation commission, says much will depend on the contents of the apology. He describes the current relationship between the government and the aboriginal community as "faulty and filled with mistrust and misunderstanding". 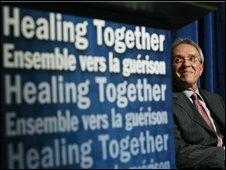 "It is unworkable," he says, "and what happened with residential schools is part of it." The hope is that a full and sincere apology will be a new starting point, "a reference point for a new beginning", Mike Cachagee says. Chuck Strahl, the Minister of Indian Affairs and Northern Development, said he hoped it would bring "renewed hope, faith, mutual respect and trust" between aboriginals and the government. Canada's 1.2 million aboriginals are the country's poorest and most disadvantaged group. Rates of alcoholism, drug addiction and suicide are higher among aboriginals than among non-aboriginal Canadians. "Aboriginals have been in Canada for 30,000 years. We were a vibrant community and did quite well for all those years. Then we had a complete moral, cultural and spiritual breakdown because of this," says Mr Cachagee. He says the general Canadian attitude to what happened is indifference: "It's like the elephant in the living room that no-one wants to look at." His view is echoed by Mr LaForme, who adds that the Canadian public is by-and-large unaware of the history of aboriginal people. Mr Cachagee says he does not think the government's apology will make him feel any different about what happened to him or his people. "But I am optimistic that it will shed light on the issues that aboriginal people have to deal with," he says, "so that my grandchildren and great-grandchildren's attitudes - and the attitudes of Canadians towards them - will be different."